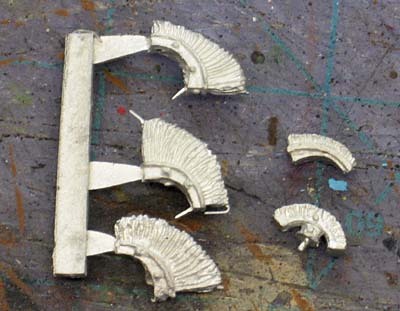 There are lots of ways out there these days to add that extra touch to your army. And you don't have to be a master sculptor either to get some nice looking results. We all want our army to stand out from the rest of them. Whether you're playing Tyranids, Space Marines or even Dark Eldar, you don't want to be just another Hive or just another Chapter or even worse, just another Craftworld (or whatever those Dark Eldar are). You want your army to stand out. Maybe you wrote some background, maybe you've got a custom character model to lead your force, maybe you have nothing at all. 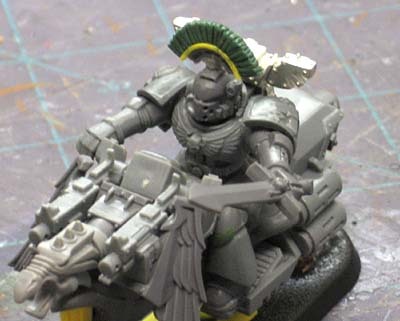 You can see 40k Hobby Blog's greenstuff crest here on his Astral Claw Sergeant. And that's just it, with all the third party vendors out there making insanely cool additions, there's really no reason not to have a converted army. It used to be that you had to be some kind of master sculptor or conversion pro (or play Orks) if you wanted any kind of conversions in your army that made them stand out more than just the obligatory arm or head swap. People ask me to build models all the time that are unique. We all want to have something that is ours. Something that won't be found across the table from us when we sit down to play. A while ago, these were sent to me to try out. I think misterjustin from Secret Weapon Miniatures has a sick sense of humor since he waited until I was done sculpting my own to send me these to try out. I recently cleaned one up, attached it to a spare helmet I had lying around and painted it to see just how "easy" it was to make an alteration like this. I have to say, it wasn't that hard to do. Like all pewter bits, they take some cleaning (doesn't everything) and the results are definitely worth it. With the rise of third party providers giving us regular gamers these "option," you no longer need a degree in sculpting to have these kind of cool things in your army. 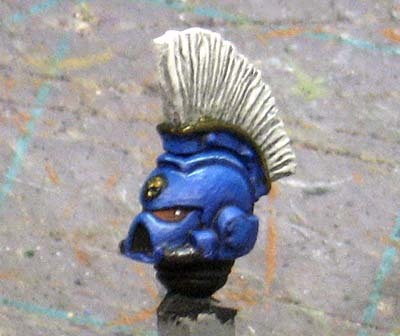 Naturally, these Roman style crests don't apply to Tyranid players, but for Space Marine players, it would take nothing at all to outfit a squad with these to give them a unique look and make them stand out on the tabletop.